Heated Ayurvedic oils, selected according to your body's constitution, are poured over your skin. A deep kneading, acupressure and lymphatic massage are used to clear accumulated toxins which if ignored result intension pockets and sluggish skin. The techniques are modified to address your individual needs. A full body polish is applied to refresh and leave your skin glowing. Your hands and feet are given that extra boost with the application of a nourishing mask which is wrapped to keep warm, whilst Cheryl works on your face. 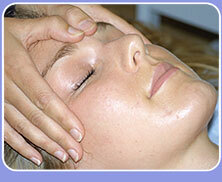 The facial part of the treatment uses the Carole Franck Curative Skincare Range . A full scalp, neck and shoulder pressure point and lymphatic massage is also included to ensure all areas of tension and fatigue are addressed. The treatment concludes with a prescription facemask and moisturiser to compliment your skin. A truly top to toe therapy!